Despite the referendum result, Basque nationalists still see Scotland as an inspiration for their own national struggle for self-determination. 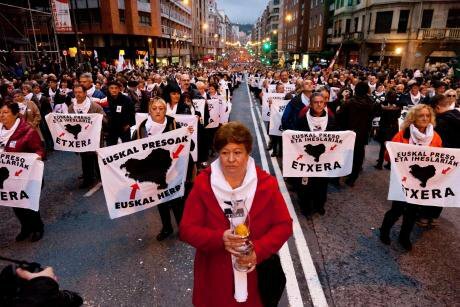 Basques march to protest to the Spanish government's policy on Basque prisoners. Demotix/Javi Julio. All rights reserved. In the early hours of September 19, when news broke that the pro-independence vote had lost the referendum in Scotland, Basque nationalists were deeply saddened. But when hours and days went on, a sense of happiness about the whole process began to emerge. Basque Nationalism has fond memories of the referendum in Quebec in 1995. Nowadays that is both far away in time and distance. Scotland, however, is much closer to the Basque Country and its September referendum took place while the echoes of the armed struggle are fading further and further away. This along with the referendum announced by the Autonomous Catalonian government is having an effect on the political panorama in the Basque Country even though the proposed referendum has been temporarily suspended by the Spanish Constitutional Court. All these elements are having a great impact in Basque society, and especially within the pro-sovereignty movement. It strengthens the belief that Basque society has the right to decide its own future. On June 8, 140.000 people joined the two main Basque cities – Durango and Iruñea/Pamplona – with a 120 km-long human-chain. It was the biggest mobilization in the last 40 years. During the transition from dictatorship to democracy in Spain, two autonomy statutes were set up in the Basque Country. On the one hand, three provinces were put together to create the Basque Autonomous Community; and on the other, the province of Navarre, considered by Basque nationalists to be the cradle of the Basque nation, became a separate autonomous community, something which has remained an open wound in Basque society ever since. It was not only the territory which was split in two. Basque nationalism was also was divided. On the one hand, the PNV (Basque Nationalist Party) accepted the path of autonomy. On the other, the left-wing nationalist movement did not. The separatist armed group ETA was in this second group, and it continued with the armed struggle it had begun during the Franco regime. Its main political claims were Basque Country's self-determination and territorial unity. ETA rejected the armed struggle in 2011 without achieving any of these claims. Today, the left pro-sovereignty movement is trying to push forward a peace process to focus on the effects of the armed conflict, but the Spanish ruling right-wing party PP has not joined in these efforts and prefers to let the situation go to waste, hoping that the whole Basque nationalist movement, including the PNV, will go with it. Nowadays, around 400 ETA members and dozens of political prisoners are dispersed among various Spanish prisons, most of them hundreds of kilometres from their homes. An attempt to come to terms with both the thousands of victims – among them around 800 people killed by ETA – and the hundreds of prisoners who remain in Spanish jails, remains an ongoing issue. The Spanish government wants to stymie the new approach of the Basque pro-sovereignty movement. And it might be said, with regards to the peace process, it is achieving the goal. At least for now. But the same thing can’t be said about the pro-sovereignty movement, which became strongly galvanised after ETA gave up its armed struggle. For example, the pro-independence left party formed the coalition EH Bildu with other Basque pro-sovereign parties, and in 2012 it became the main force in some elections, challenging the dominance of the centre-right nationalist party PNV. But even within the PNV, the pro-sovereign trend has taken big steps in the last 15 years. For example, the PNV has claimed that the Statute of Autonomy created after the Franco-era is no longer valid. In addition, in the last decade the president of the PNV, Juan Jose Ibarretxe proposed to Madrid the idea of a Basque autonomous country freely joined with Spain. The regional residents had the right to decide their own future. In 2005, the Spanish Congress killed the chance of a referendum on the matter taking place. For many reasons, it was a big defeat for Basque nationalism, but at the same time, it strongly increased awareness of the right to self-determination. From then on, that right would be based on the idea that Basque society has to decide its own future democratically, as in Quebec, Scotland and Catalonia. But the Basque pro-sovereign movement still has two main problems to solve. Firstly, wounds opened during the armed struggle have to be closed in order to strengthen reconciliation and to solve the political conflict in a democratic way. Secondly, the problem of territoriality has to be resolved. The Basque Country is divided into three administrative territories: two of them in Spain, and the third in France, without any autonomy. So who can vote in a hypothetical Basque referendum? Moreover, Basque nationalists are only a majority in one of the three territories (64% of representation in Parliament). How do we move forward in obtaining the right to decide, and how do we do it in a united way when in only one of the three administrative territories –where 70% of population live – is there a clear democratic mandate? Within the confines of Basque nationalism, it hasn’t really been discussed or even thought about, but in the last number of years , doors have been opened, and certainly in the near future this subject will be talked about and discussed with much more normality. For now, independence seems very far off in Basque society, for many reasons. The Spanish wall is there, as can be seen in the Catalonian process. Still, the Spanish government exhibits anti-democratic behaviour in prohibiting - in Basque Lands or in Catalonia - a non-binding inquiry where citizens can say what their opinion is. Spain can offer a carrot to Basque or Catalan nationalists and put a brake on the growing pro-sovereign process, as happened in 1978, by offering a higher level of self-government, but closing the door on the right to decide. That is, allow the vote, but only on one thing: more self-government, yes or no? And in these cases people usually answer yes. In many cases the states try to split independence sentiments this way. The pro-sovereignty movement have realised that it is easier to reach the people with the right to decide than with the right to self-determination, that wide sectors can join the idea of separating from Spain, especially if this country is ruled by the right wing, destroying the welfare state and deepening the neoliberal model. Unlike in Scotland and Catalonia, the bonds between sovereignty and a better standard of living are not yet properly established in the Basque Country, but the doors have been opened. The coming months may lead to important changes: in May 2015, provincial and municipal elections will be held, and at the end of 2015, general elections in Spain. The unionist right-wing may lose power in Navarre, and the PP will almost surely lose the absolute majority in Spain. The Catalan independence process will continue to move forward and the Basque pro-sovereign movement will continue flying the Scottish and Catalan flags, trying to pave the road to sovereignty.